The SM488 car or truck seat rail or floor mount can be used with all smartphones, including the iPhone 6 Plus, 6, 5, 5S, 5C, 4S, and 3GS, Samsung Galaxy Note 4 and Note 3, Galaxy S6, S5, S4, and S3, LG G3 and G2, Nexus 6 and Nexus 5, HTC One M8 and One Max, Droid MAXX, Nokia Lumia 1520 and 1020, Motorola Moto G and Moto X. The universal design of the Mega Grip Holder accommodates any smartphone having up to 3.25” width with no height restrictions, making it compatible even when used with a large protective case or skin. 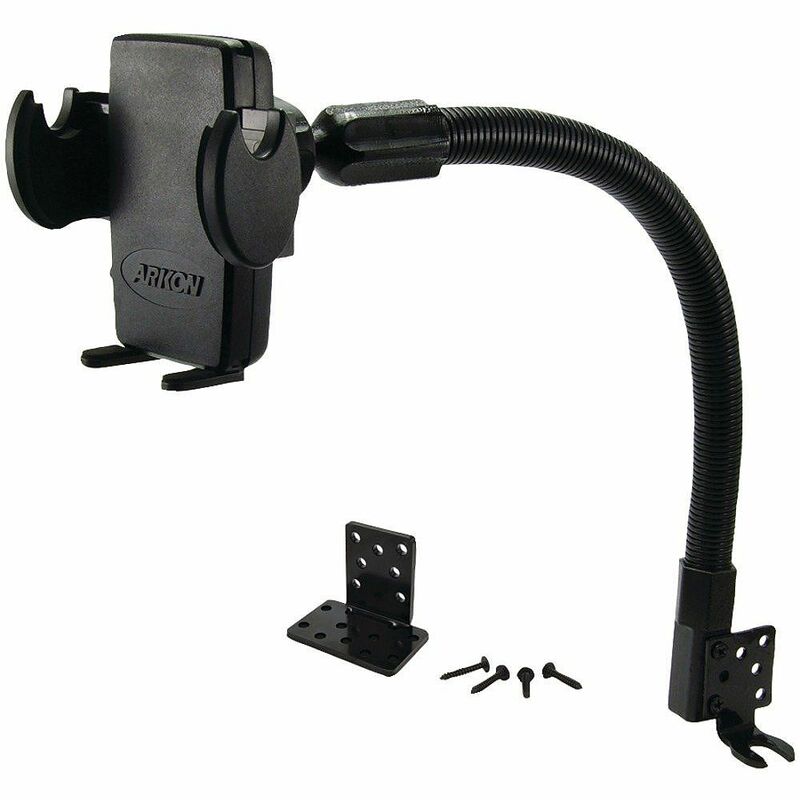 This mount includes Arkon’s Mega Grip one-touch push-button holder and 18” flexible aluminum gooseneck floor mount. The holder’s unique side-grip technology provides a strong grip that’s easy to use. Just set your phone in the mount and close the arms to lock in place. A push of the holder’s side button releases the phone. The car seat or floor mount is made of strong, yet flexible aluminum, and is ideal for those who need easy access to their smartphones but prefer mounting them somewhere other than the windshield or dash. 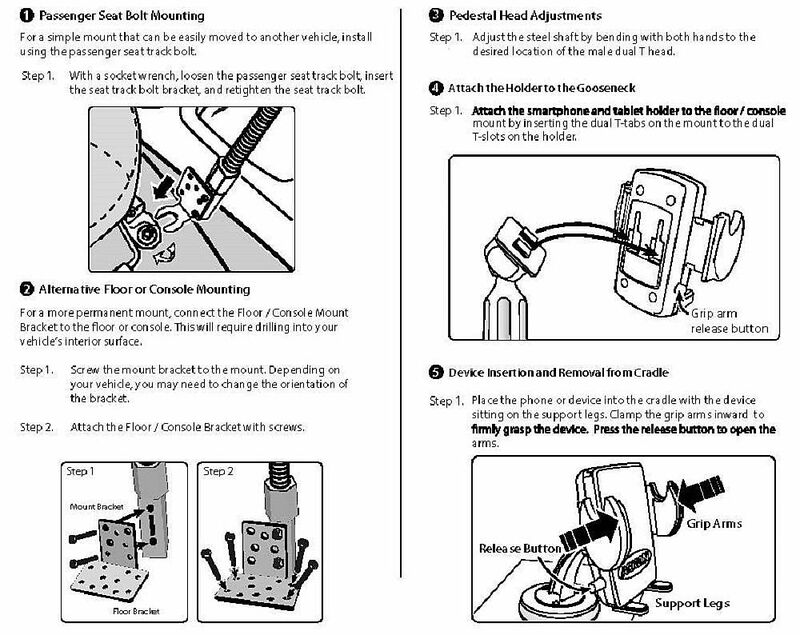 Install the mount to the car’s seat rail with a socket wrench by loosening the passenger seat track bolt, inserting the seat track bolt bracket, and retightening the seat track bolt. Bend the 18” gooseneck and rotate the swivel ball adapter head for 360° rotation, giving you the ultimate flexibility in viewing the smartphone from any angle. Optional floor brackets are included for screwing the car dock directly into the floor of the vehicle. (Warning: Drilling into the vehicle’s floor may damage the vehicle. Use caution and consult a mobile install professional to avoid drilling into any sensitive vehicle components.) For a larger seat rail or car floor mount, Arkon recommends Model SM488L22, which features a 22” flexible aluminum gooseneck.